When I went to college in Boston a while ago, there was an Italian restaurant called Vinny Testa’s (I frequented the locations on Boylston Street and in Lexington). Vinny Testa’s was similar in style to Buca di Bepo, except not a national chain, so automatically more awesome. I think maybe the best thing they served was roasted garlic bulbs with bread. The first time I saw those bulbs I thought, “What the?! ?” But I tried it. And it was seriously amazing. For some reason you think the garlic will be overpowering and strong, but it’s surprisingly not and is in fact divine. Side note: I think Vinny Testa’s might be closed. Can you Bostonians fill me in? I have a sneaking suspicion their roasted garlic bulbs will now forever be a memory. It is SUPER easy to make and such a great side to serve with dinner. Your house (and your breath) will probably smell pretty, pretty, pretty, pretty garlicky (any Larry David fans in the house? ), but it will be worth it! 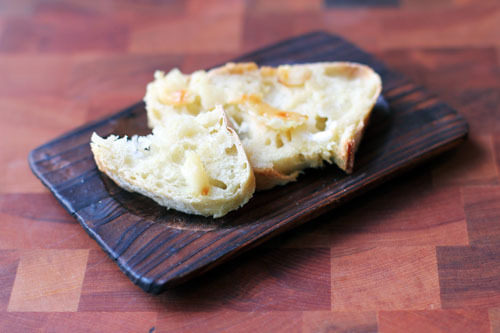 Spread this garlic on your bread and you will be eating hands-down the best garlic bread ever. I tried roasting the garlic two ways – wrapped in foil and not wrapped in foil. As you can see, the bulb that was not wrapped in foil went kind of nutso…beyond caramelized, the bulbs popping out of the bulb. It also cooked much faster this way. I personally liked the bulb cooked in foil better. The taste wasn’t different, but I felt like the cooking was more controlled, albeit a little slower. You still get a bit of caramelization on top, but all the bulbs behave themselves. Here’s a side-by-side, cooked with no foil on the left (after I cut the crazy tops off) and cooked in foil on the right. 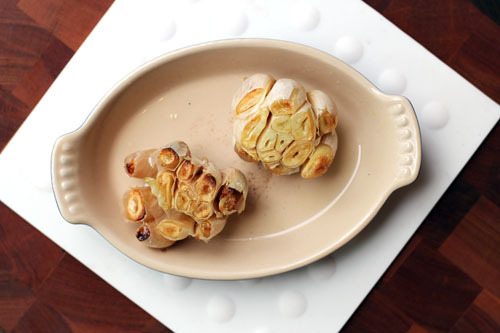 Peel off the papery outside of the garlic bulb, leaving the cloves in tact and their individual skins attached. Cut off the top of the bulb so the cloves are exposed, probably about ½”³ or so. Sometimes you get a few bulbs around the outside that are too low to make the cut, so I just cut their tops off individually. If you are going to cook the garlic in foil, place the bulb in a piece of foil, then slowly drizzle olive oil all over the bulb, letting it seep down into the cloves. 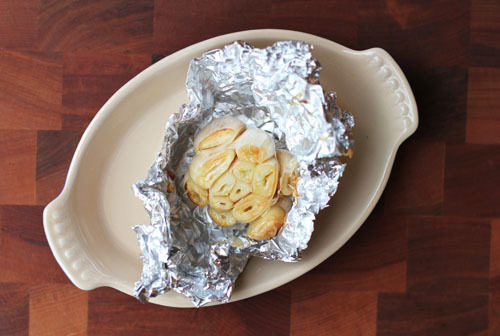 Wrap the foil around the garlic and place on a baking pan or dish. If you are not going to use foil, place bulb on a baking dish and drizzle slowly with oil as described above. Bake garlic in a 400-degree oven for approximately 30 minutes in foil or 20 minutes if not in foil. You basically cook the garlic until the cloves are nice and soft. Let cool a bit then serve with a knife. Dig the cloves out of the bulb with the knife then spread on your bread. 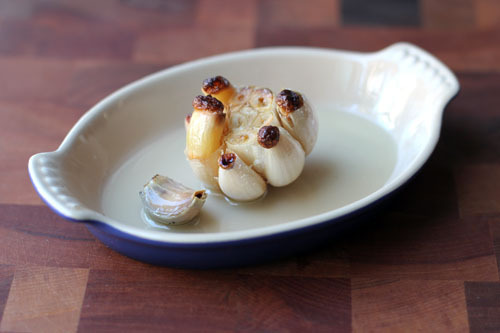 You could also use the roasted garlic for cooking (think sauces, vegetables, the possibilities are endless!). Yea as far as I know Vinny Ts is no longer. All locations I have driven by are something else now. It is hard to keep a business stay open on deliciously roasted garlic alone. As soon as I saw Vinny Testa’s I KNEW I had to say something! I went to school in Philadelphia and every time my now husband, then boyfriend, would come down we would head there! We STILL talk about the food and how good it was!! 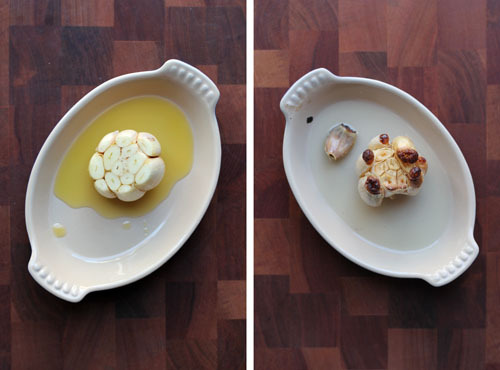 I love roasted garlic…and Larry David for that matter. Btw…I’m posting a small ‘twist’ on your bistro chicken tomorrow. I hope you will drop by and check it out. Vinny Testa’s actually was the model for Buca Di Beppo. Read a bio on the original owner of the chain (buca) and it told the story of Vinny’s. Think it is pretty funny since my maiden name was Testa..never tried it but we sure love Buca! yum yum yum!!! One of my favorites!!!! FYI: If you bake the non-foil wrapped garlic with the cut side down, it tends to behave better and not pop out all over the place. Also, when you lift it to turn it over, a bunch of the cloves fall out and save you having to pick them out. Nice caramelization on the top of the garlic, too. Mmm, garlic prepared this way is sooo good! but I was always intimidated to try it, because my mom had a nice little clay pot for roasting garlic, and I just always assumed that’s what I would use too. This is great, as I am currently trying to pare down on my belongings before moving to nyc! Thanks for the tips! Wow, I can’t wait to try this and can’t believe I never have before! 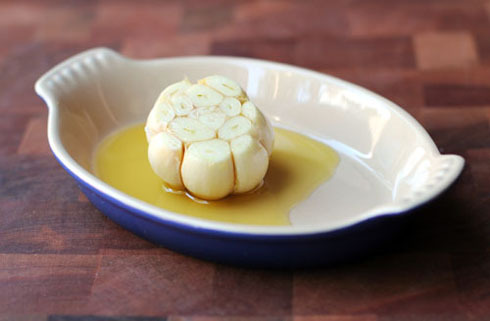 Your timing is great too, I just did a post on oursweetlemons.com all about garlic. Great minds think alike! I am going to have to go buy me some garlic cloves and make some more bread to go with it. I can already envision how my house with smell with fresh baked bread and garlic. To be even more sinful, my friends dad used to use a pad of butter instead of olive oil. It was amazing. I was just thinking about roasted garlic the other day and couldn’t remember how hot or how long. I am so happy I came across this today! I love when I have time to sit and play on your blog. I just wish my printer was working instead of having to hand write everything I find. Many years ago I went there when I visited my sister, but I live in Ohio. I emailed them letting them know that I really enjoyed their garlic, but couldn’t go to their restaurant of course. I asked if they would tell me how they make it so I can still enjoy it. This is what they wrote back to me…. 1. Trim root portion of garlic so that the bulb sits flat. 2. Cut the top (stem) to expose the cloves. 3. Lay in a roasting pan, clove side up, packed firmly together. 5. Add enough olive oil to cover bulb(s). 6. Add 1/2 bunch Rosemary. 7. Roast in a pre-heated oven at 275 degrees for 1 hour or until golden brown. 8. 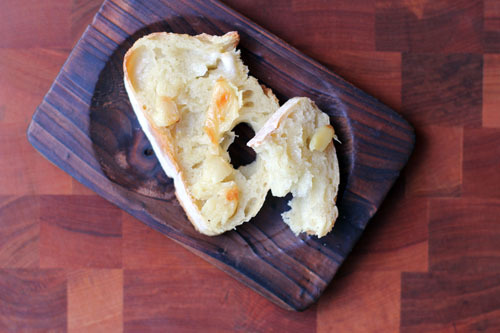 Serve with crusty bread or focaccia. you ROCK. I love that you got this from them – woohoo!!!!!!!!!!!!!!!!!!!!!!!!! !